I need to make two 2" gaps in already-install trim / quarter round to install mounting brackets for blinds. How best to make these cuts? This is an inside tight install of blinds where the depth of the window sill (just above the two red boxes) is too shallow by 1/4"-1/2" for the mounting bracket, required minimum depth is 3/4", and at that would leave the bracket and blinds protruding beyond flush. I want to install as deep as practical to match the two other windows (not shown) where the inside tight install has blinds just flush with edge of sill. I can't do an outside install of blinds due to ceiling bulkhead on right, and for aesthetic consistency with the other two windows (not shown). 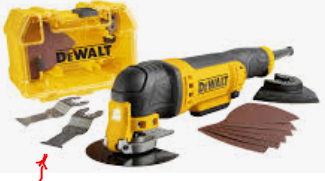 It may be possible for you to rent one of these tools if you do not already own one. Alternatively the molding can be cut using a hammer and very sharp wood chisel. From looking at your picture it looks like the molding is paint locked in place so it may not be necessary to nail the remaining molding after you cut out the two slots. However you may want to be proactive and nail the ends of the molding near where the cuts will be made before doing any cutting. This step would be particularly valid if using the hammer and chisel cutting method because the pounding could dislodge the paint lock on the molding edge. Not the answer you're looking for? Browse other questions tagged wood trim cutting or ask your own question. Can I use just molding to hold down a floating floor or must I use quarter-round? Should I remove and replace base trim or install quarter round when installing laminate flooring? How do I cut a straight line in an installed wood floor for a flush mount HVAC vent? How to cut 45 angles in quarter round shoe molding with circular saw? Do I need to apply polyurethane on stained quarter round?